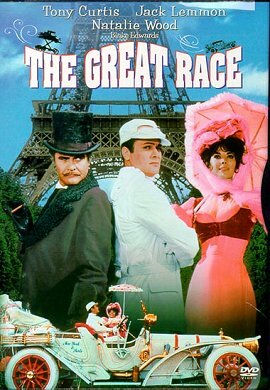 Blake Edwards’ movie, The Great Race has always been one of my favorites. It’s an epic comedy starring Jack Lemmon as Professor Fate (and Crown Prince Frederick Hoepnick), Tony Curtis as “The Great Leslie,” and Natalie Wood as Maggie Dubois. I remember seeing it at the drive-in theatre when I was 11 or 12, and anytime it comes on cable I’ll watch it again because it’s so fun and silly. It has a great plot: a turn-of-the-century automobile race from New York to Paris (westward across America, the Bering Straight and Russia), with a little romance and lots of slapstick. Ian was over one weekend (he was just a little under 6 years old), and we were watching some TV before he went to bed. I noticed that The Great Race was on, and he loved movies, so I thought he would enjoy this one. He thought it was hilarious – he laughed and giggled, and really enjoyed the action and pratfalls, the big pie fight and more. Come and carve your name next to mine. And your love will be true evermore. I love ‘The Great Race’! I also LOVE ‘The Sweetheart Tree’!!! I saw it on TCM a few days or so ago too and turned the volume up to sing the song. Then it’s in my head for days. Ian has great taste – in movies and aunts! Hi Michelle, thank you for the comments and for reading the blog! I love the movie as well and anytime I know it’s on I’ll watch it. There’s something about it that you can watch over and over again and it’s still funny and still charming.